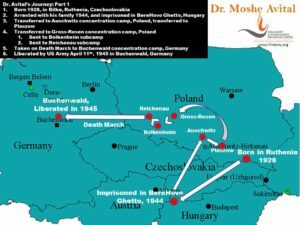 Dr. Moshe Avital was born in Czechoslovakia. During the Holocaust he was imprisoned in 6 concentration camps. He was deported to Auschwitz at age 14 with his entire family, was separated from them, and after much suffering he was liberated from Buchenwald by the American Third Army on April 11, 1945. After Liberation he was hospitalized for 2 months in a makeshift hospital in Buchenwald. He was sent to Ecouis, a village in Normandy France for recuperation. There he joined the illegal immigration to the then Palestine. 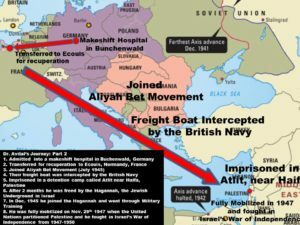 His Ship, which was named the Children of Buchenwald was intercepted by the British navy on the Mediterranean and he was forcefully removed from the ship by the British Forces and imprisoned in Atlit Detention Camp in Palestine. One night, Moshe Avital was liberated by members of the Hagganah- "A Jewish Underground in Palestine". He later joined the Hagannah and fought in the War of LIberation 1947-1950. He also fought in the 1956 War with the Israel Defense Forces in the Sinai War. In Nov. 1950 he came to the United States and pursued his higher Academic education at Yeshivah University, graduating with high honors, and earning a B.A and M.S. in Education, and a PhD in Hebrew Literature. For 50 years he served in various Educational positions in the United States. Dr. Avital speaks half a dozen languages and is a translator. He was the official Hebrew to English Translator for the ABC Network for the proceedings of the then Egyptian President Anwar Sadat's historic visit to Israel, and the proceedings of the Knesset- Israeli Parliament- in Nov. of 1997. 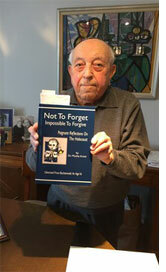 Dr, Avital is a well known author and speaker on the Holocaust. He presents extraordinary testimony, both as a survivor and as an educator, bringing to light many unknown facts of the Holocaust Era. He provides Psychological, Philosophical, and Theological analysis, as well as reflections regarding the perpetrators of the Holocaust. He is married to Anita Hershman Avital, is the father of 3 daughters and 11 grandchildren. 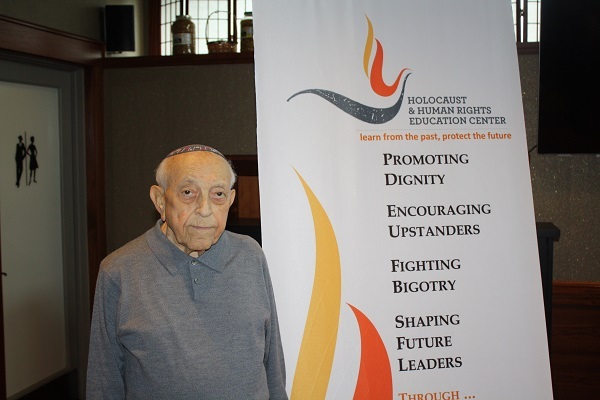 Below is a link to an interview with Dr. Avital on Yom Hashoah at the Museum of Jewish Heritage in NY.